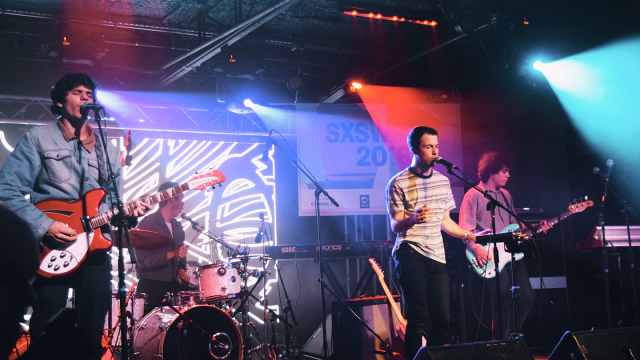 During the week of SXSW 2018, SXSWfm was given the opportunity to interview Cole, Dylan, and Braeden from the Californian band Wallows. We chatted about first meetings, past band names, our favorite Beatles songs, new music, and their time here in Austin. Read an excerpt of the interview below, and listen to it in full on our mixcloud. How many times have you played at SXSW? Is this your first year? Dylan: This is our first year – first time. Why was coming to SXSW so important to you? D: I mean honestly, it was so important just because it’s a right of passage for upcoming artists to play here, do showcases, and introduce themselves to new audiences and fans alike who want to come; and there’s just so many awesome people who play here every year. And for us, we were just stoked to be a part of it. We’ve always looked at South By and said “oh one day we will play at South By” and now we’re here which feels right and really cool. I’m hoping to come back next year … just one day we’ve been here and we’re already having a really good time. Cole: We’re only doing four showcases, but I’ve seen bands that are doing 16 or something ridiculous, and it’s like, I want to come back and do even more. It’s a really good vibe around this place. D: We really wish we were playing like that. I want to do the full experience. But we are starting light. Only five songs out right now, it makes sense. Okay, so let’s start at the beginning. I heard you formed at a very young age. A long time ago. How did you guys meet, how did this happen? How did Wallows happen? Braeden: We met when we were all very young. Dylan and I met when we were very, very young. We were like nine. We kind of bonded over music, classic rock music. I started playing guitar – my dad’s a guitar teacher so he taught me – so I learned Green Day songs, the classic bit. And then we started listening to The Beatles and stuff … Dylan actually invited me to this music program in L.A. called “Join The Band” where they bring random kids together to hang out and jam, and then play a show on the strip, on the Sunset Strip. And then Cole was actually the drummer that was in the room when we showed up. And then we thought he was awesome and cool so we decided to keep it rolling … that’s crazy, that’s going so far back! But then we just kind of stuck with it and we went through different variations of band names and Wallows formed last year as that name and these songs. Yeah, we’ve been together for a long time. So when you guys were that age, did you think “Oh, we are going to be so big.” Did you know you would be at the success level you guys are at now? D: I’d say we were the most confident when we were 13. I think our confidence level has gone down as we’ve gotten older. Not in a bad way – I think our brains got more realistic. I mean, no we never thought we were going to be big. I mean I remember when we were 14 we were like “if we toured forever doing 200 people clubs, that would be awesome!” So it’s kind of the same mindset honestly as when we were kids. It’s just however many people latch on to it, we are fine with. I’m not afraid to be super huge; I’m also not afraid to be super underground. It’s just whatever kind of audience we get. As long as you’re playing. D: As long as we’re playing; as long as people like it. As long as we have fun doing it, and we enjoy what we’re doing. How would you guys describe your sound to a new listener because you have been compared to some crazy big bands. C: I mean we have been compared to The Strokes, Arctic Monkeys, and that kind of – or the old Arctic Monkeys. But I don’t really want to say what I would describe our sound because I feel like it’s subject to change. I don’t think we want to be tied down to any one particular thing. But I will say our main influences are Arcade Fire, Dylan is a total Frank Ocean dork, sorry I just really attacked you. D: I’m on the reddit page all the time. I’m a part of the cult. So you’ve released five songs, like you said, since April. Is it important for y’all to just keep pumping out music? You didn’t want to just do two and have that be an EP? Was it important, as a new band, to keep sending those singles out to have more content? D: Yeah, I think content is extremely important. I think some of the most thriving artists right now are putting out music left and right, and consistently good music. So if you can find a way to consistently release great music, that’s the best thing possible. But also just doing it at a realistic rate and at a rate that’s not overbearing either, like four singles we put out, and then the new one will be on the EP. So we will have ten songs out because the EP is six songs, and then we are going to record our album this spring and have an album out by the beginning of next year. By the time we come back to South By, for example, we will have, what, 20 songs out, or something near that, which will be exciting to actually have more material to play. It definitely is a goal – like the tour we just did was great and really fun, and South By is great, but it will be fun to go back on the road and do South By and all of this again when audiences and people can come to the show and know all of the songs we play. I’m just excited to move on already – do our work and move on and do this all again when people care even more. So the new EP – it’s going to be new songs? You know people release singles and then that’s the EP. It’s going to be all new songs? D: The EP is all new songs besides “Pictures of Girls.” We released that as its own single, but that’s from the EP. So what’s next? You’ve got the EP, you said the album, are you still touring? D: We are recording an album, and then we are going to do some one-off shows for the rest of the year because we won’t have enough time to do another tour. But we will be doing some major city stuff, and festivals. And then next year, I think once the album is out, we will probably do a much bigger version of what we just did. I’m not saying venues, but just longer, more cities, worldwide, kind of stuff. We can foresee the next year and a half, and then who knows what will happen after that. Tune in to hear the full interview with Wallows below. Keep checking our Mixcloud page in the coming weeks as more interviews with 2018 SXSW Showcasing Artists are released. You can listen to SXSWfm 24/7 via our online player.